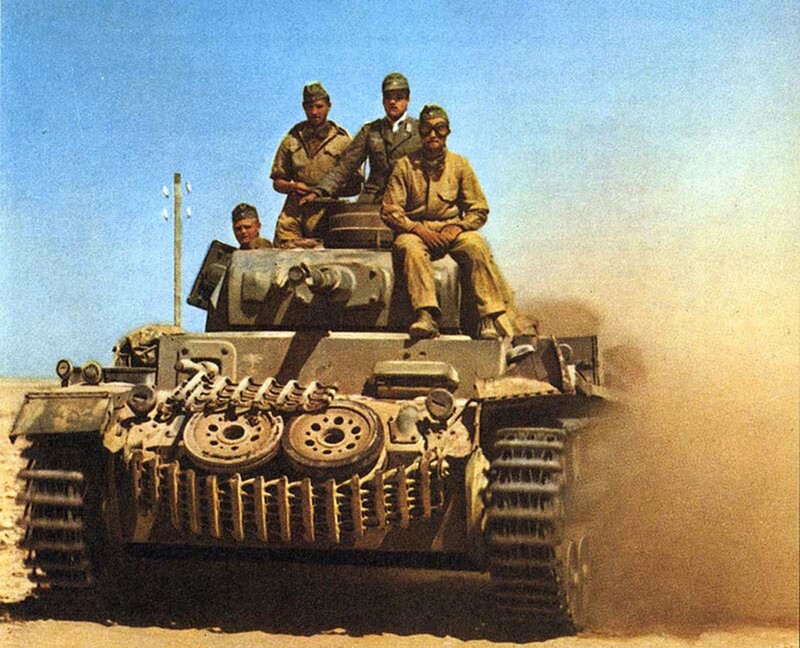 German Panzer III in the Western desert, 1942. Panzer III design was composed of four sections – hull, turret, and front superstructure with the opening for the turret and rear superstructure with the engine deck. Each section was of a welded construction and all four were bolted together. The hull was divided into two main compartments divided by a bulkhead. The front compartment housed the gearbox and steering mechanism and the rear one both the fighting and engine compartment. Basic hull, turret, superstructure and crew layout remained unchanged throughout the production life of Panzerkampfwagen III series. From April of 1940 to February of 1941, 600 new Ausf G (6-serie) tanks were produced by Daimler-Benz, Henschel, MAN, Alkett, Wegmann, MNH and FAMO (chassis numbers 65001-65950). Ausf G was a slight improvement over previous Ausf E and Ausf F tanks. Some 50 Ausf G tanks were armed with 37mm KwK 35/36 L/46.5 gun mounted in an internal mantlet, while the rest with 50mm KwK 38 L/42 gun mounted in an external mantlet. Both 37mm and 50mm tanks had additional two MG 34 machine guns, one in the turret and other in the hull. Armor protection ranged from 12mm to 30mm, although majority of the protection ranged from 21mm to 30mm. Also new pivoting visor for the driver (Fahrersehklappe 30) was installed. The turret was modified and mounted on the roof with a fan exhaust as well as one signal port was eliminated. Mid-production vehicles were mounted with new type of commander’s cupola as used in Panzer IV Ausf E, F and G, which became standard on all later models of Panzer III. Late production vehicles had wider 400mm tracks instead of standard 360mm tracks. Ausf G was the first to be mounted with the “Rommelkiste” (Rommelbox) – turret mounted storage bin (Gepack Kasten), which then became the standard on all Panzer IIIs. From August of 1940 until 1942, all 37mm Ausf G tanks just as Ausf E and F tanks were rearmed with 50mm KwK 38 L/42 gun. Vehicles send to North Africa were equipped with additional air filters and different cooling fan reduction ratio. They were designated Ausf G(Tp), Tp being short for Tropisch / Trop / Tropen – tropical. Small number of Ausf G tanks remained in service as late as September of 1944. In October of 1940, Ausf H (7-serie) entered production. It was produced by MAN, Alkett, Henschel, Wegmann, MNH and MIAG until April of 1941 with 308 produced (chassis numbers 66001-66650). Ausf H featured newly designed turret to mount 50mm gun with a single 30mm armor rear plate. Armor protection ranged from 10mm to 30mm but hull front and rear as well as superstructure front had 30mm armor plates bolted on to them increasing the protection. The increase in armor protection in Ausf H neutralized the threat of British 2pdr, Soviet 45mm and American 37mm anti-tank guns. The new six speed Maybach SSG 77 gearbox replaced previously used Variorex. In addition, suspension system was slightly modified and new sprocket and idler wheels were used in Ausf H. Consequently, of weight increase to 21.8 tons due to armor protection increase, torsion bars were strengthen. Originally, Ausf H was armed with 50mm KwK 38 L/42 gun and two MG 34 machine guns but in 1942/43, they were rearmed with 50mm KwK 39 L/60 gun.